We all have them and today it was my turn. I'm under a huuuuge amount of pressure right now at work (deadlines, deadlines, deadlines) and it was just one of those days where nothing I did came out right - even in the kitchen. I made cupcakes last night for Doug's D&D gathering tonight, but I didn't make the frosting because I was out of butter. So this morning I went to the store on the way to work and planned on making frosting when I came home for lunch - hah! The baking gods did not find me worthy and my chocolate seized up and burned (I've never burned chocolate before!) the butter was mushy, I used every bowl/pot/utensil I could find, etc. The frosting was 'meh' definitely sub par, I was a little embarrassed to send them, but hopefully they'll eat them anyway. The bright spot of the day was coming home and finding happy little packages. New cupcake papers from Bake It Pretty and earrings from Oh, Hello Friend. 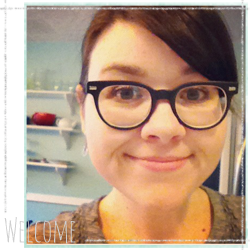 I just 'discovered' the Oh, Hello Friend blog (so gorgeous!) and her Etsy shop The package was wrapped up so nicely too, just lovely. The earrings are much bigger than I normally wear (I knew that though) but I really like them, the design is so sweet. I'm now lusting over these earrings. I'm spending the night listening to Iron and Wine, knitting on the Francis/Francie sweater and hoping for a better tomorrow. This week I deviated from the original Dorie recipe a little. #1 I enjoy ginger in some baked goods, but fresh, raw ginger isn't my favorite (even on sushi), so I left it out of the lime cream. #2 I don't really like meringue that much either, plus the only other time I ever made a meringue pie topping it was a complete fail. Instead I made whipped cream for the top. #3 The only lime pie I can ever recall eating was the kind served at Morrison's Cafeteria and it was a shade of green not found in nature with little stars of melty cream on top. Thus, I decided to go old school and added a couple of drops of green gel food coloring to my lime cream. Dorie gives the option of using a regular pie crust or a graham cracker crust. Since I loathe making regular pie crusts I made a graham cracker crust. This was a fun thing to make, the lime cream is delicious, a perfect mix of sweet and tart and it would be equally good as lemon cream. Although 2.5 sticks of butter in the lime cream folks! I think my cholestrol went up 50 points with one slice. Thank you to Linda of Tender Crumb for this fun selection! Laziness wins, so here are few words and more pictures of the weekend, Sunday more specifically. Spent a sunny morning with coffee and lemon-poppy seed muffins (Dorie's recipe) with a smattering of strawberry jam homemade from a friend. Worked on finishing the Francis sweater from last spring, it needs sleeves and the cowl. I forgot how soft the alpaca/wool is, I'm ready for weather cold enough to wear it in. Baked a graham cracker crust for tomorrow's TWD. We had gorgeous weather this weekend so we celebrated by taking a little afternoon drive here. My poor little garden. The weather has not been kind to it. We had a really hot June and then a cooler and really wet July and now it's August and super hot again. The garden is not fond of this type of treatment. I have gotten a few little harvests of tomatoes and beans and peppers. Despite my best efforts, almost the entire squash family of plants did not recover from the powdery mildew and I pulled up the dead/dying ones last weekend. The butternut squash is the only thing that seemed to look okay. I'm skeptical that it will actually produce a squash but we'll have to wait and see. It has lots of blooms but that's about it. I dug around for potatoes too, the vines had all withered and died a couple of weeks ago. I found enough potatoes for one meal for us - they were bite-sized. The purple Peruvian were bigger but there were more of the la ratte potatoes. Again, I'm considering the weather in relation to this grow-fail. I don't know if I'll try potatoes again, maybe sweet potatoes since I think they grow in this climate a little better. We had the tiny potatoes roasted in the oven with olive oil, sea salt, garlic and rosemary. The tomatoes are not doing much better, the horned tomato worms are every where and I've only been able to locate and pick off a few of them. The Roma tomato plant from the compost is doing the best, although the tomatoes are more the size of grapes than Roma's. I'm okay with that though. I have a lot of green tomatoes but not many without splits and a black spot or two. From what I can tell some of the plants have blossom end rot too. The green beans and the purple pole beans are blooming again, taste-wise I prefer the green beans but the pole beans grow really well. Hot weather has it's benefits, the peppers are exploding because they adore the heat. The golden bell peppers are huge and a couple might be ready to pick in the next week or so. I have more Serrano peppers than I know what to do with and they are HOT. My eggplants aren't not thriving, I did get one that was a decent size. There are a few more on the vine but I don't know that they'll make it. I'm going to try to plant a few fall crops in the next couple of weeks. I bought October beans, arugula, cauliflower, broccoli and rainbow swiss chard. The beans will be planted this weekend but the other things will probably have to wait until the first of September. Doug has a plan to make tops for the beds so once it finally gets cold I'll be able to turn the raised beds into cold-frame boxes. Lastly, my second crop of figs is starting to come in. I grabbed a couple and just ate them in hand. They're a little smaller than the first crop but still tasty. This is going to be short and sweet because I'm running low on time. This week's recipe was chosen by Karen of Something Sweet by Karen. As much as I love chocolate sometimes it's nice to make something that doesn't include me having to chop bittersweet chocolate. The bars were really, really good. The batter made a super-moist, tasty cake chock full of pecans, crisp apple bits and plump raisins. Doug got the job of peeling the apple with this contraption that he loves. I doubled the glaze and OMG it was soooo good. I told Doug "this tastes like fall" and it does, which makes me long for cooler days and Honeycrisp apples. A repeat recipe for sure, although next time I'll bake it in cupcake form to make it easier to share. Thanks Karen! Work has gotten to the 'busy' season. I've got deadlines coming out of my ears and the only thing that manages to keep me from losing my mind is baking and knitting. My baking/making plans this weekend included Fleur de Sel Caramels, pickles and chocolate macarons. As is well documented my plans sometimes go awry. The caramel recipe is from Ina Garten, the combination of sweet and salty is probably my favorite taste. Everything went fine at first, butter and cream and caramelizing the sugar and corn syrup. The problem arose after the cream mixture and the sugar mixture met and boiled. I still don't have a candy thermometer (I have no good answer for why except I forget I need one until I need one) and I really needed a candy thermometer to gauge when the caramel was 'done'. Since I didn't have a thermometer I winged it. Oh and I winged it incorrectly, the caramel set in the fridge but never 'set' up as candy, it remained a hot fudge sauce consistency. So I gave up, poured the caramel into jars and called it fleur de sel caramel sauce. We had it over leftover brownies last night. It still tastes fabulous and would probably be a welcome holiday gift. The pickles were a recipe found on the Gluten-Free Girl blog. I'm a fan of pickles and the recipe seemed pretty simple so I bought four enormous cucumbers at the market Saturday and went to town Saturday afternoon. They're currently 'curing' in a shoebox in the pantry until Friday and then I'll test one for the appropriate level of pickle-ness. At least they look pretty. Macarons were my plan for Sunday. After my first macaron fiasco that ended with my husband calling the would-be macarons 'fried chicken cookies' I was scared to try again. But this time I had the stand mixer and a better idea of what they should look/taste like and I used David Lebovitz's recipe. The egg whites took f o r e v e r to get stiff, making that much happier to be the owner of a stand mixer. It was a little difficult to get the almond mixture folded into the egg whites without taking the air of out the whites but I managed. For the life of me I couldn't find my plain pastry tip so I used decorative one and tried to smooth out the tops of the cookies with a knife. This was a 'learning' batch of macarons. The first batch baked a little too long and got burnt peaks. The last batch was much better, no burns and they were flatter. While the cookies cooled I made the filling, essentially a chocolate ganache. I could have eaten the filling alone by the spoonful, delish. After everything had cooled I made the little macaron sandwiches. They taste like macarons (based on my limited macaron sampling) and mostly look like macarons so I would call them a partial success. I have plans for more, this time with a pistachio base and a vanilla bean cream filling, maybe next weekend. I didn't pick up any flowers at the farmer's market, all the lines were packed, so instead I used some of the lantana and the dwarf sunflowers from my backyard. I'm still knitting on the Annette sweater, I swear it doesn't seem like it's getting any bigger. I might be knitting on it for eternity. A tiny brownie with a hint of orange zest and a white chocolate topping? Yes please. The bite-sized brownies were chosen by Jayma of Two Scientists Experimenting in the Kitchen. They took almost no time make and they didn't require pulling out the stand mixer. So easy and so simple. The sugar got treated with orange zest while bittersweet chocolate, brown sugar and butter melded together on the stovetop. Then an egg, vanilla and the zested sugar was added and lastly the flour/salt combo. Baking time was around 15 minutes and then they cooled on the counter. The last step was melting white chocolate and then dipping the tops of the brownies in melted white chocolate. Delicious. Thankfully the recipe only made 16 because their size means you could start popping them in your mouth and not stop until you ate them all. I spent another weekend feeling sickly. The sore throat from last week turned into a sore throat, runny nose, cough and headache. I felt terrible on Friday but got better Saturday as the day wore on. I still went to the farmer's market Saturday morning though. I bought more peaches, arugula, squash, little orange tomatoes and three huge and lovely sunflowers. Sunday I woke up bright and early and began the day by blanching peaches. I used some of them to make a peach crumble that was decent but not wonderful, I should have added milk to the dough for the topping but I didn't so it was a little dry and kind of blah. The rest I used for peach sorbet, based on this Alton Brown recipe. It's great, refreshing and light and perfect for August in Memphis. The little orange tomatoes from the farmer's market got mixed with some smallish Roma's from my backyard, as well as backyard basil for a chunky tomato sauce. The recipe came from the At Home with Magnolia cookbook. I did add some ground up flax seeds into the sauce but it didn't really affect the taste. I got two jars worth plus a ziploc bag that I stuck in the freezer for future use. For dinner Sunday night I had intended to make shrimp scampi but was missing a few important ingredients so instead I sauteed the shrimp in a tablespoon of olive oil with salt and pepper and then added some of the tomato sauce and served it topped with feta over fettuccine. My knitting this weekend was focused on this little summer cardigan from Knitty. It's a fishnet lace pattern with seed stitch trim. I'm using Tahki Cotton Classic gifted from a friend. It doesn't seem to be going very quickly though or I'm just a slow knitter (which is probably true). I'm planning on doing 3/4 length sleeves if I have enough yarn. I was thinking about using maybe yellow or red buttons or some patterned ones. I love these lemon ones, I really adore the cherries but they're sold out. These orange daisy buttons from Repot Depot are another possibility.